One of the greatest concentrations of centenarians, people who acquire the age of 100, and near-centenarians, is in Bastia, a town close to Assisi. With a population of 15,000, 197 people are between the ages of 95 and 104. Perhaps the excellent food and vino, slower lifestyle, fresh air and proximity to so many holy places accounts for their longevity. The world’s oldest man in 2002 was Antonio Todde of Sardinia, Italy, who died at the age of 112. His secret: “Just love your brother and drink a good glass of red wine every day,” said Todde on his 112th birthday. In 2003, Tziu Giuanni Frau of Orroli, Sardinia, also reached the age of 112. About 135 people per million in Sardinia live to celebrate their 100th birthday. The Western average is closer to 75. Emma Morano turned 117 in 2016. Morano, who lives in Pallanza, located on the shores of Lago Maggiore, is the oldest of eight siblings, all of whom she has outlived, was born on 29 November 1899 in the Piedmont region of Italy. She is the last person in the world known to been born prior to 1900. Her longevity, she admits, is partly due to genetics - her mother reached 91 and several sisters reached their centenary - and partly, she says, thanks to a rather unusual diet of three eggs - two raw and one cooked - each day for more than 90 years. The famed composer Giuseppe Verdi was born Giuseppe Fortunino Francesco Verdi on 10 October 1813 in the Duchy of Parma in Le Roncole. His family moved to Busseto in 1824 which Napoleon occupied. He was later nicknamed the “swan from Busseto.” Giuseppe’s father was an innkeeper and his mother a spinner. Verdi wrote Nabucco, based on the Biblical plight of the Jews and Babylonian King Nabucco (Nebuchadnezzar in English), which opened at Teatro alla Scala in Milano on 9 March 1842. The success that followed solidified his popularity as a composer. The Hebrews’ chorus Va pensiero, sull’ ali dorate (fly, thought, on golden wings) became so popular that it was often sung in the streets and considered as an option for the Italian National Anthem. He composed some of the opera’s most popular plays and other musical compositions: Rigoletto (1851), La Traviata (1853), Il Trovatore (1853), Aida (1871), The Requiem Mass (1874), Simon Boccanegra (1881), Don Carlo (1884), Otello (1887), Falstaff (1893) and Ave Maria, Stabat Mater, Te Deum and Laudi alla Vergine Maria (Four Sacred pieces) in 1898. Verdi was nominated to the Italian Senate in 1874 due to his popularity and contributions to Italy. The maestro died on 27 January 1901 at Hotel Milano in Milan. Verdi is acclaimed as one the world’s most gifted musical artists, an exemplary citizen and a generous philanthropist. VIVA VERDI! When Milano was still controlled by Austria, underground partisans of the Italian unification gave their campaign the secret code name “Viva V.E.R.D.I.” which was a clandestine acronym for “ Vittorio Emanuele Re D ' Italia” -Victor Emmanuel, King of Italy. This allowed supporters of nationalism to openly shout their support for Risorgimento (Rebirth and reunification). Verdi wrote “Nabucco” for this purpose and he equated the Jews as a symbol of the oppressed Italians. From that day forward, this opera and Verdi’s other plays symbolized Italian independence. Torgiano. This scenic medieval town rises on a ridge at the juncture of the Tiber and Chiascio rivers. Ten miles South from Perugia and only minutes away from Deruta, Torgiano retains some of its original walls and is well known for producing some of the best wines in Umbria. Giorgio Lungarotti made quite a mark here not only for founding one of Italy’s highest rated wineries, Lungarotti, but also left a legacy by building the Wine and Olive Oil museums. The Wine Museum “Museo di Vino”, considered one of the best in the world, is located at Corso Vittorio Emanuele 31, Torgiano in the Province of Perugia. Telephone: 075-9880200. museovino@lungarotti.it Torgiano is one of 48 official CittaSlow – Slow cities, as awarded by the Italian government and Slow Food for urban excellence, hospitality, conviviality and commitment to Slow Food ideals. Giorgio Lungarotti. Founder Giorgio Lungarotti left an indelible mark on Torgiano and on winemaking in Umbria when he died at the age of 88 in 1999. It’s hard to imagine Torgiano without Lungarotti and vice versa. Lungarotti wines have won acclaim for their quality and the commitment of Giorgio’s daughters, Chiara Lungarotti and Teresa Severini for perpetuating a legacy of fine winemaking. Lungarotti’s Vin Santo was used by Pope John Paul II in 1982 during the communion when he celebrated mass in Assisi. Golden Gate Park, San Francisco’s largest and most iconic public space, is the site of many wonders, from the century old Bison breeding pen to the Conservatory of Flowers’ remarkable greenhouse. Yet, despite its renown, some elements of the park no longer capture the attention they used to. One such example is sandwiched between the Academy of Sciences and the DeYoung Museum, in an area known as the Music Concourse. Here, on the side of the road, one can find a remarkable bridge between the Italian and American communities of a century ago. In this place, about twenty feet tall, stands a bust of a man, his head gilded all in gold and perched atop a stone pedestal. 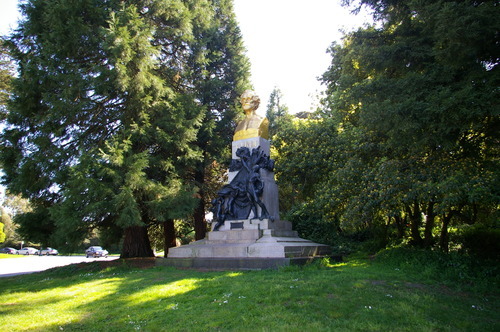 The daily L'Italia, one of several Itailan language newspapers circulated in the San Francisco at the turn of the Twentieth Century, had commissioned over $15,000 to erect the monument and intended its dedication for 1913, the 100th anniversary of Verdi’s birth – just twelve years after his death. Delays ensued but enthusiasm did not wane. When the statue was finally dedicated the following year, over 20,000 people flocked to the park to witness it’s dedication. The attendees were treated to a free performance by Italian star of the day Luisa Tetrazzini who, although she was afflicted with a cold, sang Verdi’s music fiercely across the Concourse to Italians and Americans alike. pianse ed amo per tutti. He wept and loved for all.